Experience quality telephoto zoom and unique macro capabilities with the Sigma 70-300 mm f/4-5.6 APO DG Telephoto Zoom Lens for Nikon cameras. Produce a variety of shots from portrait to landscape with the Sigma telephoto zoom lens for Nikon DSLR cameras. Get up close and personal with a maximum magnification of 1:2, a focal length of 70-300 mm and a minimum focusing distance of 150 cm - perfect for capturing anything from magnificent buildings to action shots during sports. 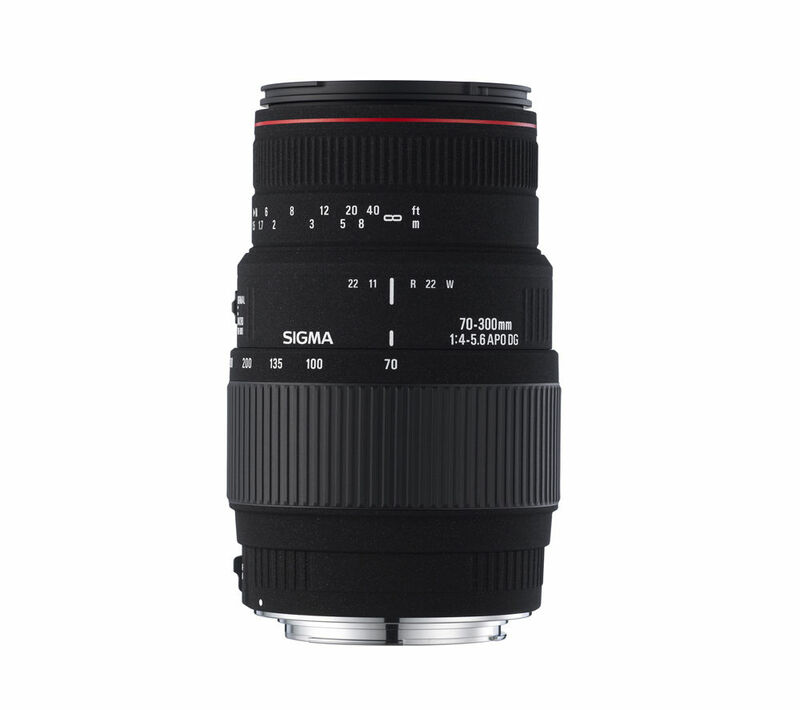 This telephoto zoom lens is supplied with a complete lens hood, helping you to avoid flare whether you're shooting outside in sunlight or near a bright artificial light source. 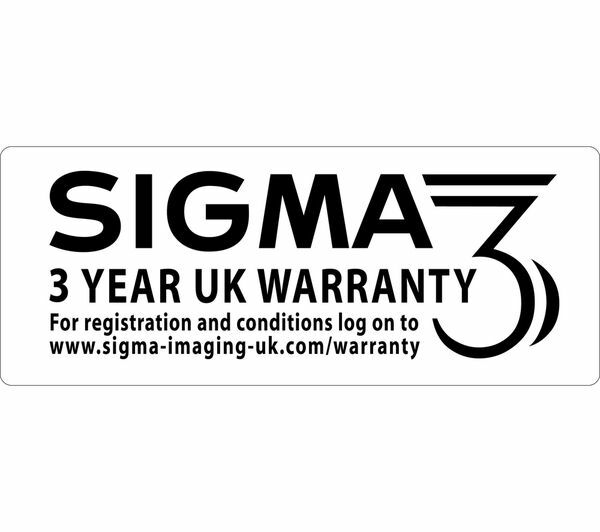 There's no need to worry about distortion with this Sigma 70 - 300 mm f/4-5.6 Telephoto Lens thanks to its intelligent Special Low Dispersion (SLD) glass. With two SLD glass elements in the front lens group and one in the rear, chromatic aberration is kept at bay. The multi-layered lens coating helps to reduce ghost and glare on your images, with enhanced contrast and perfectly balanced colours. The high-performance macro setting makes the Sigma APO Telephoto Zoom Lens a unique specimen. 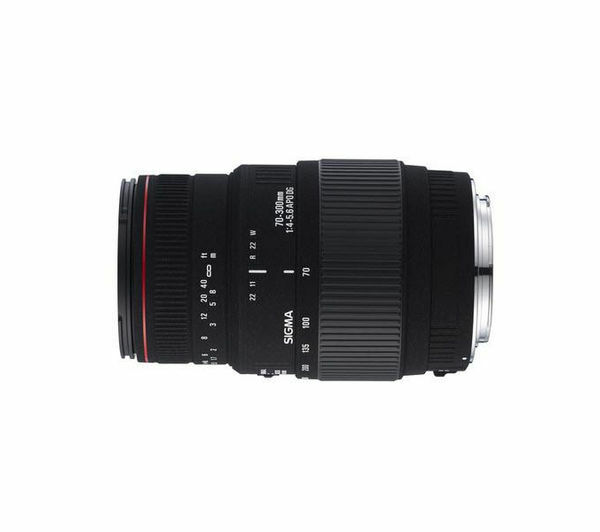 This macro function operates at focal lengths between 200 mm and 300 mm, with a minimum focusing distance of 95 cm, maintaining great optical performance throughout the zoom range. Perfect for close-up wildlife shots, the macro setting enables you to capture creative images without disturbing your surroundings. With a flexible selection of manual settings and a multi-layered lens coating, the Sigma 70-300 mm f/4-5.6 APO DG Telephoto Zoom Lens for Nikon is a versatile choice for photographers who want to create crisp and compelling images. Pay & Collect – pay online, and have the item sent, for free, from our warehouse to a local store for you to collect. Starting on the date the item arrives in store – which you choose in checkout – you have 28 days to collect it. If you’re buying this item online, you can apply for credit at checkout. Or, if you’re reserving online, or shopping in store, apply here. DSG Retail Limited acts as a credit broker and not a lender. Credit is provided by Creation Consumer Finance Ltd. Both DSG Retail Ltd and Creation Consumer Finance Ltd are authorised and regulated by the Financial Conduct Authority.